Our Detroit Michigan personal injury attorneys at the law firm of Buckfire & Buckfire, P.C. recently settled a lawsuit pre-suit on behalf of a pedestrian victim who suffered a steam burn injury after walking across a manhole cover in the city. The incident took place on July 19, 2012. Our client was pushing a client of hers in a wheelchair when she was burned severely by the steam coming out of a manhole at the intersection of Fort Street and Brooklyn in Detroit. The steam burn injury was diagnosed as a 2nd degree burn and resulted in a blistering and permanent scar. As a result, she had to seek out treatment at the Detroit Receiving Hospital and was prescribed sylvadine cream. The Wayne County lawsuit was filed against Detroit Thermal, a service company responsible for the maintenance and management of heating and cooling operations underground in the City of Detroit. Maintenance does include the management for the steam that is allowed to exhaust from manhole covers. Our Buckfire & Buckfire personal injury attorneys were able to help our client receive a settlement before ever going to court. Her settlement amount included damages for her pain and suffering as well as payment of medical bills incurred from the burn injury. 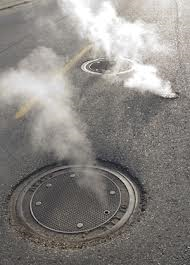 Unfortunately in the City of Detroit, this steam exhaust coming from manholes has been responsible for countless burns and injuries to adults and children. In fact, our personal injury attorneys in Michigan have handled several cases for pedestrian victims who have suffered severe burn injuries as a result of walking through steam exhaust coming from a manhole. These manhole covers are located on the city’s sidewalks and in the street. The burns occur when an unsuspecting person walks through the steam not realizing that it has the potential to cause scalding injuries to their skin. Often times, individuals who do suffer from serious injury do not realize that they may have legal rights to sue and recover compensation for any damages suffered as a result of the incident. If you or someone you know has suffered a severe burn injury as a result of walking through steam on a city sidewalk or street, you do have rights and should call our office immediately to discuss your case with one of our top rated personal injury attorneys. Our Detroit lawyers will explain your rights to you and determine whether or not you have a case. Call today at (800) 606-1717. We offer a Free, No Obligation Case Review and if we accept your case, we will represent you under our No Win, No Fee Promise which means no legal fees or costs until your case is settled or won.